The faculty of Tourism and Hotel Management held a sports day on Tuesday, 12 March, 2019 at the university playground. This was held from 12. 30 pm to 2.30 pm. 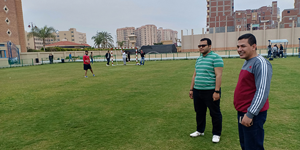 The sports day was held in the presence of Prof. Amany Refaat, the faculty Dean Faculty, academic staff members and about 100 students who enjoyed playing many activities, including tug-of-war and football.